On the next page there is a practice test for IELTS Reading Section 2. Here are some tips to help you with this section. Note down the tips that you need to practise most. Write your answers on your Answer Sheet immediately. There is no extra time given to do this at the end of the test. these tasks, as the number of words/numbers you can write in your answer can change – it may be 1, 2, 3 or 4 words/numbers. If you write more words/numbers than allowed you will lose marks. You must use words from the text in your answers. – hyphenated words count as single words. – you can write numbers as figures or words. – skim the text to find the section where the answer is, scan for key words, then read the relevant sentences for detail, if necessary. This task tests your ability to skim and scan for specific information. So read the texts in the right way – this will help you save time. You need to match information in the questions to paragraphs or sections of the passage in which it appears. – you may need to use some options more than once. – you may not need to use some options at all. – the instructions will tell you if you can use an option more than once. So, once again, it is extremely important to read the instructions and follow what they say. The texts in Section 2 are often about workplace survival and include texts about job duties, job applications, staff training, etc. Outside the classroom, try to find materials like these and read them. Train yourself to find specific information in them quickly, or to read for detail for more complex information. 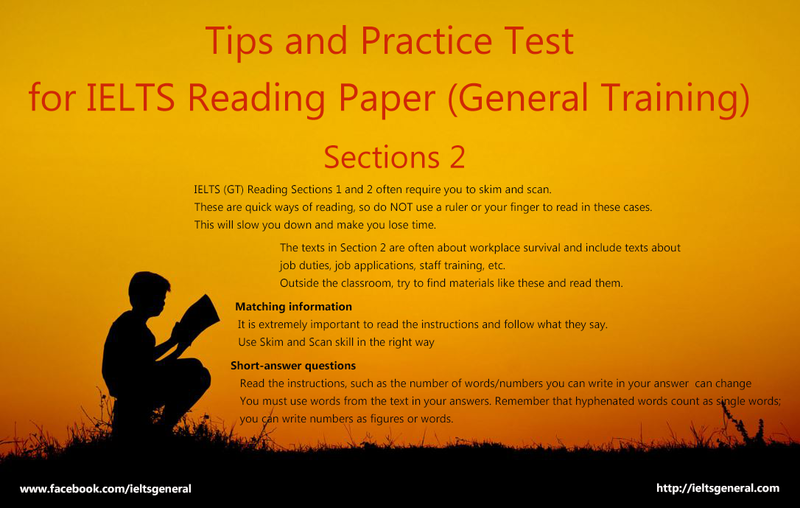 As we’ve seen, IELTS (GT) Reading Sections 1 and 2 often require you to skim and scan. These are quick ways of reading, so DON’T use a ruler or your finger to read in these cases. This will slow you down and make you lose time. We offer our summer staff two kinds of accommodation. You can stay in the home of a local family. All our families are carefully chosen and will provide you with a single bedroom. If you have any special dietary requirements we,together with the family, will make sure your needs are met. This year, staying with a family costs £150 per week for half board i.e. breakfast and evening meal. There are many advantages of staying with a family: the first is experiencing the culture, seeing from the inside how people live in another country. The others, of course, are making local friends and having opportunities for language practice. If you prefer, you could stay in residential accommodation. This is on the site of the local Tourist Training Institute. It provides individual study bedrooms with en-suite shower facilities and a fully equipped kitchen which you share with other summer workers who will be living in the eight rooms in your block. This option costs £90 per week, including the room, bed linen and towels, and weekly cleaning. It does not include food. In the vicinity of the Institute there are many good, cheap cafes and restaurants, or you could buy food and cook for yourself. On the site, you have access to TV lounges, tennis courts and a swimming pool. If your job application is accepted you will be sent a form for you to complete telling us which accommodation you require, and giving your bank details etc. Choose NO MORE THAN FOUR WORDS AND/OR NUMBERS from the text for each answer. Write your answers in boxes 1 – 6 on your answer sheet. What meals are included in the price? Name one advantage of staying with a family. Who do you share the residential accommodation with? Name a room you can use with other occupants. Our training centre is based in the city of Lincoln, close to Hull, Sheffield, Nottingham and the east coast. Over the centuries, Lincoln’s geographic position helped it grow into a well-known market town in the Middle Ages and later into an important industrial centre. Nowadays, with a population of approximately 120,000, Lincoln is a bustling, energetic city, thriving on its recent developments such as IT and the new university as well as its many tourist attractions such as the cathedral, the castle, the Roman remains and its medieval houses. And we must not forget its strong cultural life. Lincoln offers, among other things, theatre, film and archaeology, a famous Christmas market and many events and activities geared towards teenagers and those in their twenties. attractive tourist destinations in the UK. Our newly built training centre is about 3 miles outside Lincoln with which it has excellent transport links. It comprises lecture and seminar rooms, laboratories, workshops, accommodation and leisure facilities such as a cinema and a bowling alley, which are open to the public. It has already won prizes for its outstanding architecture and is surrounded by beautiful woodland. All trainees have single accommodation in residences. This consists of a study bedroom with a private en-suite bathroom. The bedrooms are fully furnished, centrally heated and air-conditioned. Please note that towels and bed-linen are not provided. There are also shared kitchens, which are equipped with fridge, freezer and oven or microwave; trainees need to provide their own cooking utensils, crockery and cutlery. The residential accommodation is 2-minute walk from the training facilities and 5 minutes from bus stops. The text has four sections, A – D. Which section mentions the following? Write the correct letter A-D in the boxes 7-13 on your answer sheet. You can leave your answer for IELTS General Reading Section 2 in the comment box to be corrected by our team or leave your email there to receive the answer key via email. Hope you find this post useful! Could you please send me the answer to this question set? Can you please email the answers ? Can I know the answers? Please kindly send me materials for ielts general training module most especially reading. Please, send me all materials for general training module.